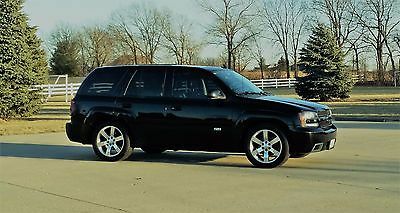 07 trailblazer ss. Runs and drives great. 3SS Package. Many modifications have been made. Pcm of NC attitude v3 camBrian Tooley titanium valve springsHardened pushrodsFAST injectors E fansPcm of NC cold air intakeNew factory timing setNew melling high pressure oil pumpNgk plugsPcm of NC spark plug wiresPcm of NC battery cablesPcm of NC front mount trans coolerCorvette servoCircle D 2800 stall torque converterKooks long tube headersKooks off road y pipePcm of NC TCMMail order tune by pcm of NC Paint flaking at rear bumper and high mount brake light panel.Some small dings/scratchesNormal interior wear for 118k milesSlight oil leak at rear main seal.Stock cat back Exhaust was cut near rear axle and will need to be welded or replaced. New front brake pads and rotorsNew motor mountsFront tires at 5/32"Rear tires at 4/32" (drag radials)Rear brakes at 4-5/32" Must be paid in full before vehicle picked up or shipped. 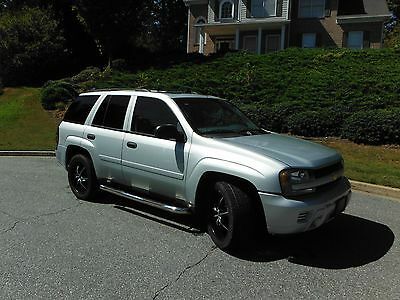 2006 Trailblazer SS, AWD, 136000 miles. 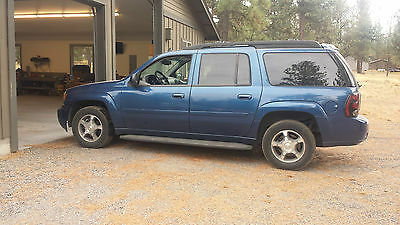 DVD, Power Seats, Leather, Air Ride, Bose, Moonroof, Weathertech mats, good tires, religiously maintained, zero rust. LS2, bone stock, tons of power. Really just a great vehicle. I've taken a video to try and give you the very best understanding of this vehicle. Clean title in hand. Not a show truck but great for 11 years old and 136k miles. https://youtu.be/I6zNSBAK-RQ I will be happy to take another video of anything specific you want to see. This is also for sale locally and this Ebay listing may end at anytime. 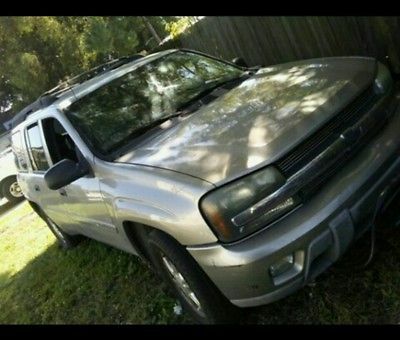 Project 4x4 Chevy Trailblazer 5.3 with engine knock,sounds like rod knock starts runs moves so it could be driven onto a trailer.I had plans to put in 6.0 out of a 2010 chevy 3/4 ton truck.My understanding is they are a plug and play swap then a custom tune.It would make a fun toy.I have other projects I need to get too.Body and paint is really pretty good,Interior real good,damage on front bumper cover and slight damage to right rear bumper cover.Good tires has sunroof leather LT extended body with 3rd seat. Aamir (407) 739-0607 ? ? ? Description SCROLL DOWN TOWARD THE BOTTOM FOR 120+ HIGH-QUALITY PICTURES! SAME LOW, ROCK BOTTOM PRICES PLUSFREE SHIPPING TO ANY STATE IN THE CONTIGUOUS U.S. THIS OFFER IS ONLY VALID ON SELECT VEHICLES. (ONLY A FEW STATES ARE EXCLUDED IN THIS PROMOTION - PLEASE CALL OR MESSAGE US TO FIND OUT IF YOUR STATE IS EXCLUDED) YES, THIS PARTICULAR VEHICLE IS PART OF THE "FREE SHIPPING" PROMOTION. THE "FREE SHIPPING" SALE IS FOR A LIMITED TIME ONLY! SO HURRY UP AND "BUY NOW!" RED TAG = ROCK BOTTOM PRICEPLEASE NOTE: RED TAG SPECIALS ARE FOR A LIMITED TIME ONLY. THE VEHICLE MAY BE SOLD LOCALLY. IN THE UNLIKELY EVENT THAT A VEHICLE WITH A RED TAG SPECIAL DOES NOT SELL BEFORE THE END OF THE SALE, THE PRICE WILL GO "BACK TO NORMAL." WE WILL NOT HONOR RED TAG SPECIAL PRICES AFTER SALE ENDS. RED TAG SPECIALS ARE FIRM LIQUIDATION PRICES. 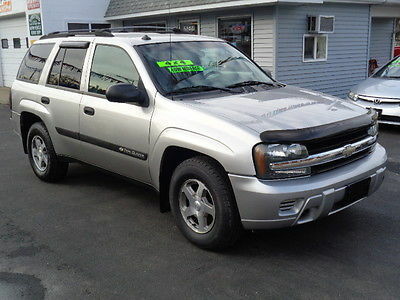 THIS IS THE REAL DEALBEST DEAL ON A RARE, LOW MILEAGE 2007 CHEVY TRAILBLAZER SS AWD SUV! 91K LOW MILES6.0L V8 AWD! 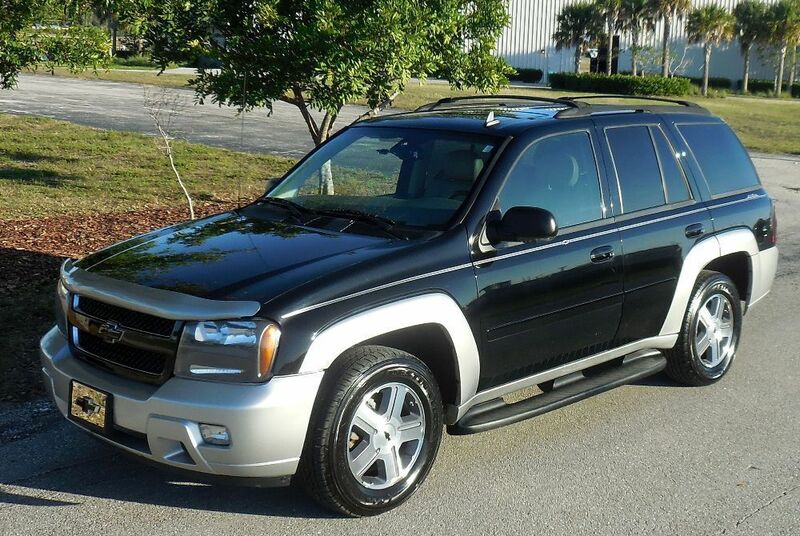 POWERFUL BEAST!CARFAX SHOWS NO ACCIDENTS EVER!GORGEOUS BLACK LEATHER INTERIOR WITH SUEDE INSERTS!MP3/CD PLAYER! 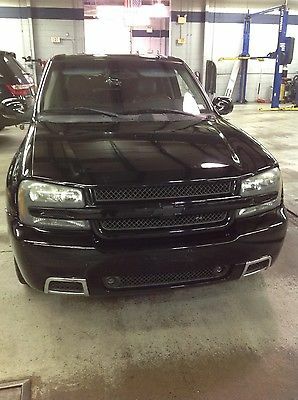 PREMIUM SOUND!USB/AUX INPUTS!ONSTAR!POWER SLIDING SUNROOF!ICE COLD A/C WITH DUAL ZONES!REAR AIR CONDITION WITH SEPARATE CONTROLS!CRUISE CONTROL!POWER WINDOWS/LOCKS/MIRRORS!DUAL POWER OPERATED SEATS!LUMBAR SUPPORT!TOWING PACKAGE!PREMIUM 20" FACTORY UPGRADED WHEELS!ABSOLUTELY GORGEOUS VEHICLE!LET THE PICTURES DO THE TALKING! 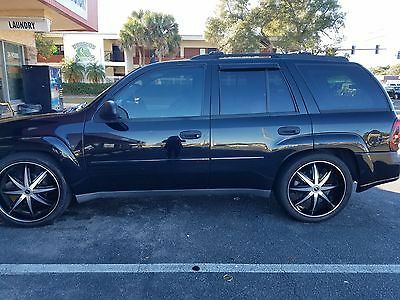 ATTENTION: THIS VEHICLE IS LISTED FOR SALE LOCALLY AND MAY BE SOLD BEFORE THE AUCTION ENDS...IF YOU SEE THIS AD, THE VEHICLE IS AVAILABLE - PLEASE CONTACT ME DIRECTLY WITH ANY QUESTIONS: (407)-739-0607 IF YOU HAVE ANY QUESTIONS, PLEASE CALL ME DIRECTLY ON MY CELL AT (407)-739-0607 MONACO MOTOR GROUP FOR MORE INFO, CALL ME ON MY CELL: (407) - 739 - 0607 BID WITH 100% CONFIDENCE - WE DO OUR VERY BEST TO TAKE PICTURES AND DISCLOSE ALL NOTEWORTHY BLEMISHES THAT WE FIND ON OUR VEHICLES - NO NEED TO WORRY! YOU ARE DEALING WITH A GOOD COMPANY THAT WILL GO THE EXTRA MILE TO MAKE YOU HAPPY! 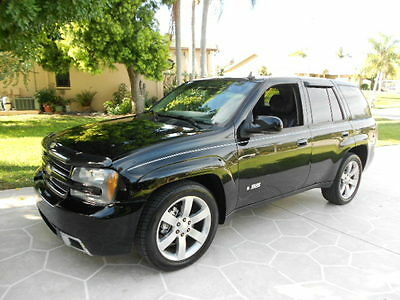 Ladies and gentlemen, what you are looking at here is a "REAL" Chevrolet Trailblazer SS - this is not a clone. This is a hard to find vehicle, especially in this sort of condition. It has only 91K miles - that's an average of only about 9K miles a year, well below the industry average of 15K miles a year. The CARFAX shows no accidents ever! It does look like it may have been repainted at some point. We see this on a lot of cars - sometimes owners get their cars repainted in order to keep their cars "looking good" as sunshine tends to oxidize paint over the years. As indicated by the images, the paint is nice and shiny on this vehicle. It is in great shape mechanically - we discovered no notable issues at all. We did not see any significant imperfections on the body. It appears to be in well above average condition for its age. 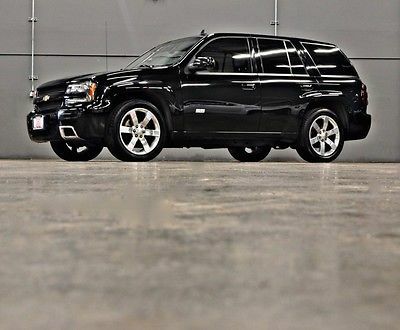 This is an exceptionally powerful all-wheel drive sport utility vehicle. The powerful 6.0L V8 is truly a beast! It has gorgeous black leather seats with suede inserts, MP3/CD player, premium sound, OnStar, power sliding sunroof, ice cold air condition with dual zones, rear air condition with separate controls, cruise control, power windows/mirrors/locks, dual power operated seats with lumbar support, towing package, premium 20" factory upgraded wheels and much more! Default About Us Monaco Motor Group is located in the Heart of Orlando, minutes away from the Orlando International Airport, Florida Mall and the famous Manheim Auto Auction. 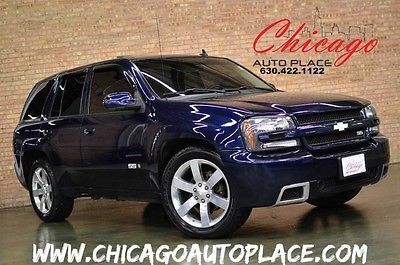 We carry a large variety of clean pre-owned vehicles at unbelievably low prices. We wouldn't want you to drive something that we wouldn't want to drive ourselves. We believe in full disclosure - in other words, we strive to make our vehicle descriptions as accurate as possible. In addition, we provide tons of high-quality pictures in all of our ads so that you, our valuable customer, know exactly what to expect! Why buy at MMG? 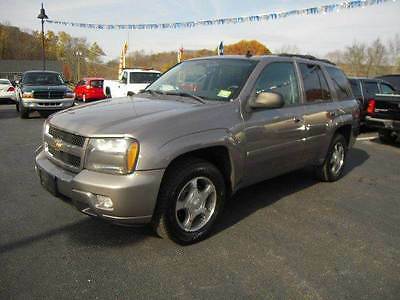 Because you will get the peace of mind purchasing from a quality used car dealer. In addition, you can view our extensive variety of luxury used vehicles in a pressure-free environment. Our cars are marked at some of the lowest prices in the country. We have a standardized process of purchasing our vehicles which enables us to offer you great vehicles at unbelievably low prices. The vast majority of our vehicles come directly from major banks and other financial institutions, allowing us to get below-wholesale rates on most of our units. Simply put, we sell vehicles for lower than what other dealerships buy them for. We are so confident about our pricing that we encourage you to shop around before you come to us. We research both the local and national vehicle market to ensure that we provide you with some of the best deals in the country. Feel free to browse our current inventory and special offers. We offer a large variety of cars in virtually every price range. Keep in mind that if you do not see a vehicle that interests you, please let us know your preferences so that we can browse our extensive dealer network to locate the right car for you. eBay Terms PLEASE FEEL FREE TO CALL ME IF YOU HAVE ANY QUESTIONS AT ALL ABOUT THIS CAR AND WOULD LIKE TO GET AN IMMEDIATE RESPONSE!!!!!! MY PHONE # IS: 407-739-0607 AND I AM AVAILABLE ANY TIME. NOTE: WE DO NOT CHARGE ANY DEALER FEES NOR ANY OTHER MISCELLANEOUS DOC/SERVICE FEES OF ANY KIND. FLORIDA RESIDENTS MUST PAY TAX & TAG. OUT OF STATE RESIDENTS WHO WOULD LIKE TO DRIVE THE CAR BACK TO THEIR HOME STATE, MUST PAY THEIR HOME STATE TAX RATE TO THE STATE OF FLORIDA IF THEY REQUIRE A TEMPORARY TAG (AS PER FLORIDA LAW) TO DRIVE THE VEHICLE BACK THEMSELVES. MOST U.S. STATES RECOGNIZE THE TAX PAID TO FLORIDA. SO, YOU WOULD ONLY BE PAYING TAX ONCE (NOT TWICE) ON THE VEHICLE IF YOU DECIDE TO DRIVE IT BACK YOURSELF. OUT OF STATE RESIDENTS WHO OPT TO SHIP THE VEHICLE DO NOT HAVE TO PAY US TAX & TAG - INSTEAD, THEY ONLY PAY FOR THE PRICE OF THE CAR PLUS SHIPPING (IF APPLICABLE) AND TAKE CARE OF TAX & TAG THEMSELVES IN THEIR HOME STATE. BUYER MUST CONTACT ME WITHIN 24 HOURS OF WINNING THE AUCTION: (407)-739-0607. WE DO NOT FINANCE....SO PLEASE ARRANGE FINANCING BEFORE YOU HIT THE "BUY IT NOW" BUTTON. MAKE SURE TO CALL US AND LET US KNOW WHAT FINANCIAL INSTITUTION YOU ARE DEALING WITH SO WE CAN CONFIRM THAT WE WORK WITH THEM. WHILE WE WORK WITH A MAJORITY OF CREDIT UNIONS AND MILITARY/NAVY BANKS, THERE ARE SOME FINANCIAL INSTITUTIONS OUT THERE THAT WE DO NOT WORK WITH, SO PLEASE CLARIFY WHICH FINANCIAL INSTITUTION YOU ARE DEALING WITH PRIOR TO HITTING THE "BUY IT NOW" BUTTON. ONCE YOU HIT THE "BUY IT NOW" BUTTON, THE TRANSACTION IS LEGALLY BINDING. THEREFORE, ONLY HIT THE "BUY IT NOW" BUTTON IF YOU ARE 100% SURE THAT YOU CAN AFFORD THE VEHICLE AND HAVE YOUR FUNDS READY. A $500 NON-REFUNDABLE DEPOSIT MUST BE MADE IMMEDIATELY AFTER HITTING "BUY IT NOW." THE REMAINING BALANCE CAN BE PAID IN ONE OF THREE WAYS: WIRE TRANSFERREDPAID IN PERSON WITH CASH OR CERTIFIED FUNDSMAILED OUT AS A CERTIFIED BANK CHECKINSTRUCTIONS FOR ALL PAYMENT OPTIONS WILL BE EMAILED TO BUYER AFTER THEY HIT THE "BUY IT NOW" BUTTON ON EBAY. YOU ARE FREE TO CHOOSE WHICHEVER OPTION WORKS BEST FOR YOU. PLEASE LET US KNOW WHICH OPTION YOU CHOOSE TO PAY OFF BALANCE BEFOREHAND SO THAT WE CAN COORDINATE. WE CAN HELP YOU ARRANGE LOW COST SHIPPING. IF YOU WOULD LIKE US TO ARRANGE SHIPPING FOR YOU, WE TAKE CARE OF SETTING UP SHIPPING WITH A TRANSPORTER AND WE HANDLE ALL INITIAL COMMUNICATIONS WITH THE SHIPPER AS WELL SO THE PROCESS GOES A LOT SMOOTHER/EASIER FOR OUR BUYERS. YOU WILL BE PROVIDED WITH THE SHIPPING COMPANY'S PHONE NUMBER SO YOU CAN COORDINATE WITH THEM. THE SHIPPING COMPANY WILL ALSO BE PROVIDED WITH YOUR PHONE NUMBER SO THAT THEY CAN PROVIDE YOU WITH AN ETA/UPDATES. SHIPPERS ARE INSURED FOR ANY NOTABLE DAMAGES/LOSSES THAT HAPPENED TO YOUR VEHICLE IN TRANSIT. WE ARE NOT LIABLE FOR ANY DAMAGES/LOSSES INCURRED TO A VEHICLE ONCE IT LEAVES OUR FACILITY. IF, IN THE RARE EVENT, ANY NOTABLE DAMAGES/LOSSES DO OCCUR, YOU CAN HANDLE IT WITH THE SHIPPER'S INSURANCE COMPANY. MAKE SURE TO LOOK OVER YOUR VEHICLE PRIOR TO SIGNING OFF ON THE BILL OF LADING. ONCE THE BILL OF LADING IS SIGNED OFF, YOU CANNOT MAKE A CLAIM FOR ANY IN-TRANSIT DAMAGES. THE LIKELIHOOD OF YOUR VEHICLE BEING NOTABLY DAMAGED OR LOST DURING TRANSIT IS PRETTY SLIM - AND NONE OF OUR CUSTOMERS THUS FAR HAVE HAD TO CLAIM ANYTHING WITH A TRANSPORTER'S INSURANCE COMPANY BUT JUST FOR YOUR PEACE OF MIND, PLEASE BE AWARE THAT TRANSPORTERS ARE INSURED IN THE EVENT SOMETHING LIKE THIS HAPPENS. THE BUYER WILL NOT PAY ANY EXTRA "HIDDEN" FEES ON TOP OF THE PRICE OF THE CAR. ALL YOU PAY IS THE PRICE OF THE CAR PLUS TAX, TAG AND TITLE. IF YOU PURCHASE THE VEHICLE AND PLAN ON PICKING IT UP YOURSELF, YOU MUST COME TO ORLANDO TO PAY FOR AND PICK UP THE CAR WITHIN 3 DAYS. IF YOU CANNOT MAKE IT WITHIN 3 DAYS, YOU MUST GIVE ME A CALL AND LET ME KNOW BEFORE PURCHASING IT. IF YOU WANT TO SHIP IT BACK TO YOUR STATE, WE CAN HELP YOU WITH THAT - BUT YOU WOULD OBVIOUSLY HAVE TO PAY FOR THAT ON YOUR OWN. WE WILL ONLY WORK WITH AN INTERNATIONAL BUYER IF THEY ARE WILLING TO ARRANGE/PAY FOR SHIPPING ON THEIR OWN. WE DO NOT ARRANGE INTERNATIONAL SHIPPING. THERE ARE MANY INTERNATIONAL SHIPPING COMPANIES OUT THERE THAT CAN HELP YOU (JUST GOOGLE THEM). OUT OF STATE BUYERS ARE GIVEN POSSESSION OF VEHICLE TITLE SO THAT THEY CAN GO TO THEIR LOCAL DMV AND GET THEIR NEWLY PURCHASED CAR REGISTERED ON THEIR OWN. WE MAIL THE TITLE OUT TO THE BUYER WITHIN 3-4 WEEKS AFTER THE VEHICLE IS PICKED UP. ALTHOUGH IN MOST CASES, THE TITLE IS MAILED OUT MUCH EARLIER, TITLE DELAYS CAN ALSO OCCUR DUE TO CLERICAL MISTAKES OR OTHER FACTORS BEYOND OUR MEANS. WE HAVE NEVER HAD A PROBLEM WITH ANY OF OUR BUYERS WHEN IT COMES TO GETTING THEM THE TITLE BUT IF YOU'RE IN ANY SORT OF RUSH TO GET THE TITLE AS SOON AS THE CAR IS PURCHASED, THEN YOU MUST CONTACT US TO CONFIRM THE TITLE IS READY TO BE MAILED. IF IT IS NOT YET READY TO MAIL, WE CANNOT PROMISE GETTING IT TO YOU IMMEDIATELY. IT IS UP TO YOU, THE BUYER, TO MAKE SURE YOU ASK IF THE TITLE IS IN OUR HAND BEFORE PURCHASING A CAR IF YOU ARE IN ANY SORT OF RUSH TO GET THE VEHICLE TITLED. NO "CONCESSIONS" OR "DISCOUNTS" WILL BE APPLIED TO ANY SALE FOR TITLE DELAYS. IN THE RARE EVENT THAT THERE IS A TITLE DELAY FOR ANY REASON, YOU (THE BUYER) MUST WAIT TO RECEIVE THE TITLE. WE TRULY MAKE EVERY EFFORT TO PRESENT ACCURATE DESCRIPTIONS OF THE VEHICLES THAT WE SELL. ANY VEHICLE TEN YEARS OF AGE OR OLDER IS AUTOMATICALLY EXEMPT FROM MILEAGE REPORTING - IF THIS APPLIES TO THE VEHICLE THAT YOU ARE BIDDING ON, PLEASE BE AWARE THAT THE TITLE WILL BE REPORTED AS "MILEAGE EXEMPT" AS PER FLORIDA LAW. MILEAGE MAY INCREASE DUE TO BRANCH TO BRANCH TRANSPORTATION, TEST DRIVES AND/OR OTHER MISCELLANEOUS USAGE. PLEASE CONTACT US IF YOU WOULD LIKE TO KNOW EXACT CURRENT MILEAGE. WE DISCLOSE EVERY NOTEWORTHY BLEMISH/FLAW THAT WE KNOW OF. HOWEVER, PLEASE KEEP IN MIND THAT WE ARE ONLY HUMAN AND MAY MISS SOME THINGS. NOT ONLY ARE WE KNOWN FOR OUR PRICING, BUT WE ARE ALSO KNOWN FOR THE HIGH QUALITY OF OUR VEHICLES. NONETHELESS, THE VEHICLES THAT WE OFFER ARE PRE-OWNED SO SOME IMPERFECTIONS ARE SOMETHING YOU'LL HAVE TO EXPECT AS A USED CAR BUYER. FOR THE MOST PART, ALL NOTEWORTHY IMPERFECTIONS THAT WE ARE AWARE OF ARE CLEARLY DISCLOSED IN OUR ADS. WE MAY ACCIDENTALLY OVERLOOK SOME THINGS WHICH IS WHY WE WELCOME PRE-SALE INSPECTIONS PRIOR TO PLACING AN OFFER. ALL VEHICLES ARE SOLD AS-IS AND NO WARRANTIES (EXPRESSED OR IMPLIED) EXIST. WE CANNOT BE HELD RESPONSIBLE FOR ANY INACCURACIES/MISREPRESENTATIONS IN OUR ADS. WE DO NOT MISREPRESENT ANY OF OUR VEHICLES INTENTIONALLY BUT IT IS POSSIBLE THAT WE MIGHT DO SO UNKNOWINGLY - THAT IS THE REASON WHY WE ALLOW AND IN FACT ENCOURAGE PRE-SALE INSPECTIONS. THE MAJORITY OF OUR CLIENTS ARE OUT OF STATE AND TYPICALLY JUST CALL IN WITH ANY QUESTIONS THEY HAVE AND WE TRY TO ANSWER THEM AS BEST AS WE CAN. AS YOU CAN SEE, OUR FEEDBACK CLEARLY DEPICTS THE WAY WE DO BUSINESS - WITH HONESTY, INTEGRITY AND RELIABILITY.TRADE-INS ARE ACCEPTED: JUST MESSAGE ME THE YEAR, MAKE, MODEL, MILEAGE, CONDITION, OPTIONS OF YOUR VEHICLE AND I WILL MAKE YOU AN OFFER PROMPTLY! YOU MUST ALSO LET ME KNOW IF THE CAR NEEDS ANY MECHANICAL OR COSMETIC WORK. FOR MORE INFO, CALL ME ON MY CELL: (407) - 739 - 0607 ? ? Copyright © 2017 Auction123 - All rights reserved. - Disclaimer +- Auction123 (a service and listing/software company) and the Seller has done his/her best to disclose the equipment/condition of this vehicle/purchase. However, Auction123 disclaims any warranty as to the accuracy or to the working condition of the vehicle/equipment listed. The purchaser or prospective purchaser should verify with the Seller the accuracy of all the information listed within this ad. Selling a Vehicle? Create Professional Listings Fast and Easy. Click Here! 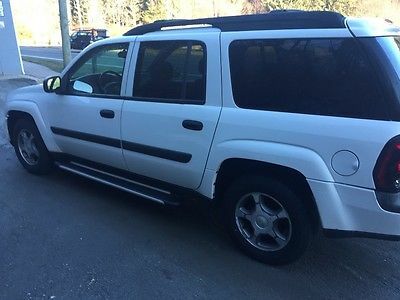 Up for bid is a USED 2004 Chevy Trailblazer LS Three Owner Trailblazer With An Outstanding Carfax, 4.2L L6 MPI, Automatic, 4×4 Powering Alloy Wheels Wrapped In Newer All Season Radials And Backed Up With Four Wheel ABS, CD Player, Cruise Control, Remote Keyless Entry, Power Windows, Locks, Mirrors, Power Driver Seat, Ample Rear Storage Capacity, Fold Flat Seats Expand Storage Capacity, Room For Five Full Size Adults With Storage Room To Spare, 4×4 Gives Safety And Security Driving In All Weather Conditions, Clean And Comfortable, Great Heat, Ready To Go Today!! 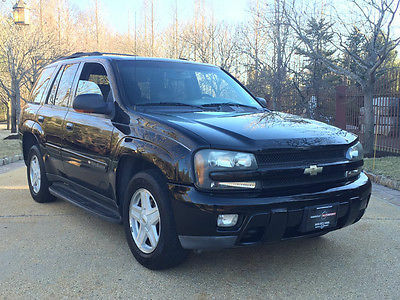 VIN # 1GNDT13S142139146Model: Year 2004Make: ChevroletModel: TrailblazerTrim: LS Specifications:Body Style: 4-Dr SUVEngine Type: 4.2L L6 MPITransmission: AutomaticDriveline: 4 x 4 I have put this Vehicle on the road. It drives great and it is a reliable vehicle. Thank you for looking at my item....Please check out all the photos so you arecertain of what you are bidding/purchasing.If you have any question please don't hesitate to contact us.Please be sure to check out my other great items.I'm always happy to combine shipping for you when possible.Thank you, Terms of Sale:PLEASE READ !! all info within the listing before bidding and contact me with any questions Once you bid you are obligated per eBay's Terms and Conditions. Payment: Full Payment is expected within 48 hours of the end of the auction or the item will be re-listed, a non-paying bidder will be filed with eBay and negative feedback will be left. PayPal Payment Options: PayPal allows you to pay by Credit Card, Debit Card & Bank Transfer for more info please check at www.paypal.com Return Policy:All returns accepted. Buyer should contact us within 7 days after receiving the item. Refund given as Money Back. Return shipping will be paid by the buyer. Shipping Release: Item will be shipped within 1 - 2 business days after payment has been made. Holidays and/or inclement weather may delay shipment of the item. I only ship in the USA. Feedback: Please contact Me before leaving negative or neutral feedback. If you are not satisfy with your item, so we can get everything solved so you can leave Positive feedback please. Thank you. Questions/Concerns: Please contact us with any questions or concerns in regards to the product. 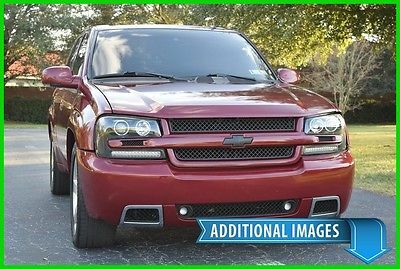 2007 Chevrolet Trailblazer 1-FL OWNER SS 2WD FLORIDA 2007 CHEVROLET TRAILBLAZER SS 2WD! 1-FLORIDA OWNER-FULL SERVICE RECORDS!